​If you are surprised to see Maple Syrup listed as an American Origin Product, it’s safe to say you’re not a New Englander! The Maple tree (family Acer) is native to North America, that is to say Southeastern Canada and the Northeastern United States. Although there exist many different varieties, the Sugar and Red Maples species are the most commonly used for the production of maple syrup, followed by Black Maple. While best known as the national emblematic of our neighbor to the North, the Maple tree is also quite a significant economic and historical staple of American agriculture. In fact, the Canadian and American maple syrup producers, sometimes referred to as sugarmakers, and the industry at large are unified under the International Maple Syrup Institute, or IMSI. One of its missions is to promote authentic maple syrup as a natural and high quality product unique to North American Maple and terroir. ​Indeed, American and Canadian Maple syrup is a naturally occurring, pure and minimally processed product. As a result, it is a rich source of antioxidants, minerals (calcium, manganese, potassium and magnesium), phenolic compounds. If you would like to learn more about the nutritional properties and potential health benefits of maple syrup, take a look at the following factsheet produced by IMSI. And don’t forget, choosing authentic maple syrup is not only a choice for superior quality, it is an act of support for traditional American agriculture. Storage Tips: Always refrigerate after opening. To preserve maple’s fresh flavor and prevent crystallization, it can be frozen. Freeze and thaw any number of times, just thaw completely, mixing in any condensation on the top before use. Maple syrup is the result of the natural processing - or concentration - of Maple tree sap. It takes approximately 40 gallons of Maple tree sap to produce 1 gallon of syrup, which should have a sugar concentration of at least 66 % and should not exceed 68.9 %. The sugar content of the syrup is produced by the Maple leaves during the summer months, which the tree then stores in its root and trunk tissues during fall and winter. Sugarmakers begin the extraction process in late January or February through a process called tapping, through which tapholes are carefully and strategically placed in the trunks so as to ensure the the trees’ well-being. Later in winter and spring, the trees’ increased uptake of water dilutes the sugar that had been stored in the form of starch, forming the sap that then flows through the tubed taps for eventual processing by the sugarmaker. All commercialized, authentic maple syrup is subject to strict quality and classification criteria. First and foremost, Maple syrup’s sugar content must derive exclusively from maple sap. Most industrial syrup competitors use corn syrup or cane sugar to imitate the sweetness of maple syrup, and some advertise and fraudulently sell these imposter products as maple or maple-flavored syrups. The IMSI supports and facilitates testing services for any dubious products on the market that are advertised as maple in an effort to combat counterfeit claims. Unfortunately, some instances of fraud have been uncovered. In 2014 The IMSI also implemented a classification system for official grades and classes of maple syrup. There are two quality-based grades, “A” and “processing”, the latter of which is not available for sale in retail but can be used as an ingredient in food processing. 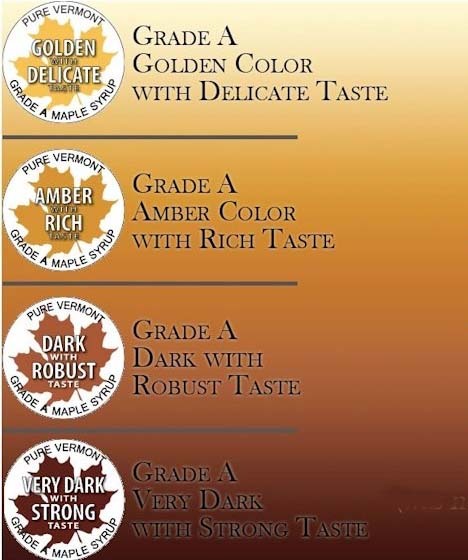 Within grade A, there are four classes, based on color and intensity of flavor: “Golden/Delicate”, “Amber/Rich”, “Dark/Robust”, “Very Dark/Strong”. The principal aim of the classification is to help consumers choose a syrup that is best adapted to their taste and use, but it also serves to display the wonderful, natural diversity of this regional agrifood product. Check out the new grading and classification system here. Authentic maple syrup has one ingredient: maple sap. Conventional syrups can have over a dozen. Read the labels carefully! Canada is responsible for 75% of maple syrup production, with Quebec being by far the most prolific of the four syrup-producing provinces: Ontario, New Brunswick and Nova Scotia and Quebec. The remaining 25% of production, more precisely 4.27 gallons, takes place in 14 American States, over 80% of which occurs in New England. Vermont alone churns out around 2 million gallons of the coveted, concentrated sap.